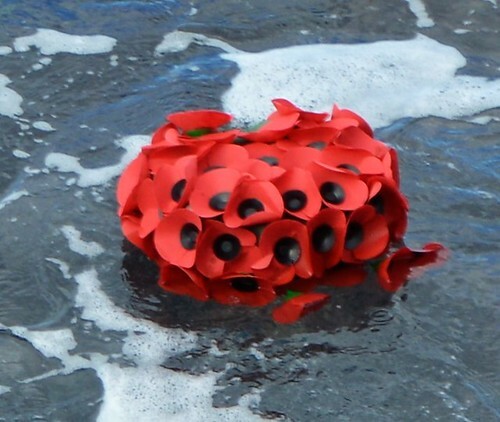 Even more poignant on the 100th anniversary of the end of the first world war, there were millions of reasons to reflect and give thanks to those who gave their lives for a better world. 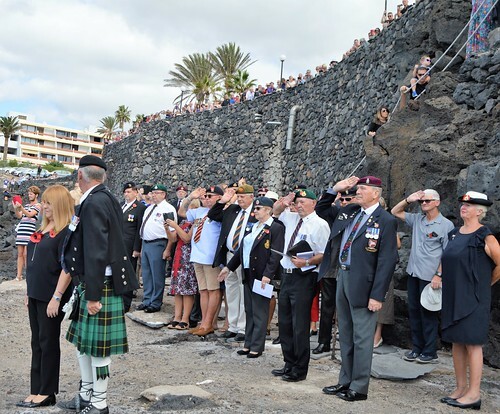 Tenerife may be a far flung holiday fun spot but ex pats and tourists joined together on Sunday 11th November for the annual remembrance day services. 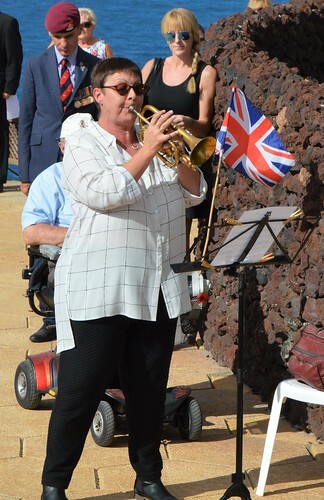 I ventured to Costa del Silencio for their outdoor service around the swimming pool of the Westhaven Bay complex. 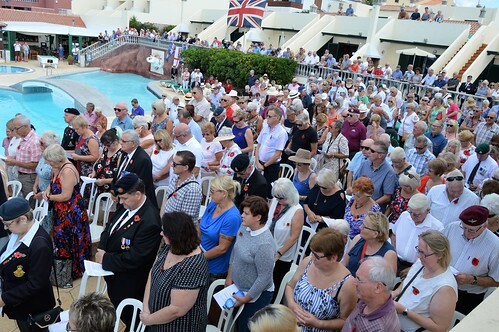 Medals shone in the bright sun but many of the faces echoed the dark memories of loss and suffering within their families. 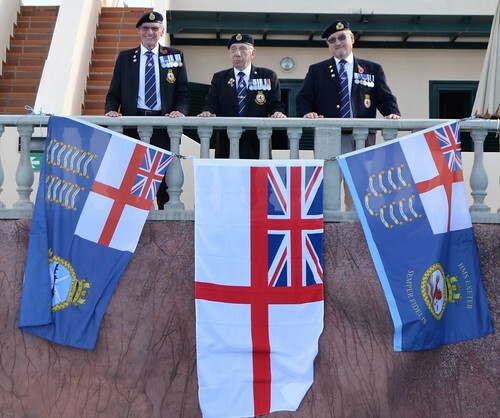 The comforting and financially supportive arm of the Royal British Legion embraces all outposts, and offers support and nurture to servicemen, servicewomen, and their families affected by all conflicts. 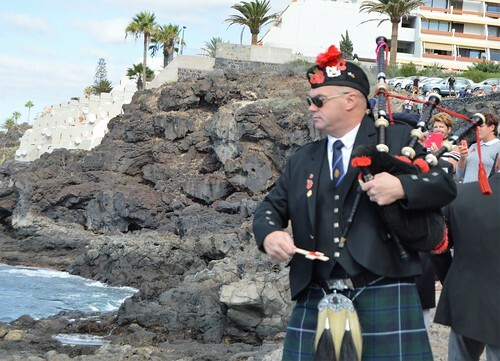 Church services took place at six other venues across the south west of Tenerife but Costa del Silencio offers a unique setting, its view out to sea acting as a window to a wider and more turbulent world. Many people wore not just medals relating to their own service in recent conflicts, but also inherited medals from family no longer with us. 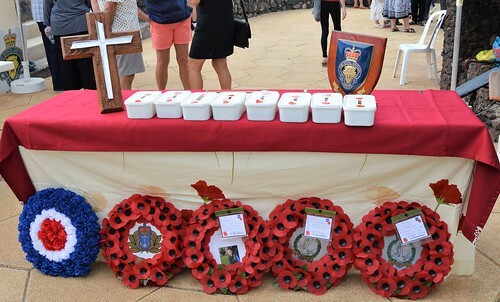 Wreaths were laid at the table and makeshift altar as several hundred people rose to sing the first of the hymns, lessons were read out by veterans, it was an emotional and testing time for them but there was no shortage of friends to encourage them along. It was noticeable that many younger people and a few children were in attendance, warnings unheeded and lessons learnt need to be shared with the next generation. I consider myself so lucky not to have been called upon to defend my privileged life, my grandad told me about a few of the horrors of WW1 but I wish I had asked him about more of his memories. This was followed by the last post, and an immaculate silence. One of the beauties of the setting is the closeness to the sea. 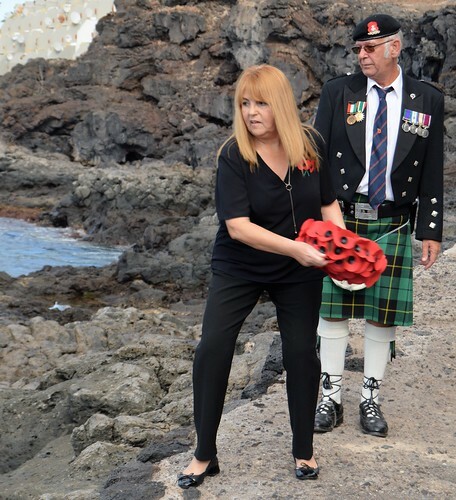 A small pathway led down the cliff to a ledge where a wreath of poppies was cast onto the sea and joined by small wooden crosses thrown into the tide. It was a wonderful service to mark a special day, however the good work of the Royal British Legion goes on throughout the year. We have a lot to be grateful for.